What a great variety of guests with different reasons to be in Carlisle PA! Last night we hosted a couple who were here for fly fishing - and they caught some trout in Big Spring near Newville! Another couple are section hikers on the AT - they will finish all of PA during the next week. We hosted a business traveler who stays with us even though her work is actually in Harrisburg. We also hosted equine and canine guests (along with their human companions) who were traveling north on I-81. They started from the West Palm Beach area of FL, made a stop in Aiken SC (big horse area there!) and will be home tonight in Saratoga Springs, NY. I smile when I hear the conversations between guests while they are eating breakfast... These enjoyable encounters between complete strangers just would not happen if those guests had chosen a hotel for the night and then had gone to some chain restaurant! They chose a better way to stay by experiencing one of today's B&Bs. 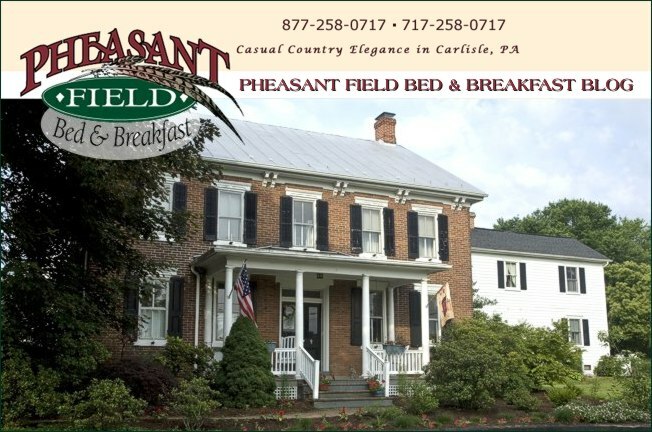 If you know someone who has never stayed at a B&B, why not give them a small gift certificate for a stay at Pheasant Field B&B or just point them to our website? You could change a person's way of looking at travel. We wish you a joyous Passover, a Blessed Easter, and a beautiful spring weekend ahead!